There’s a little discussion of the issue in the BSFA forum. And inexcusably not credited in the issue is Drew Brayshaw, whose photograph provides the basis for the cover. 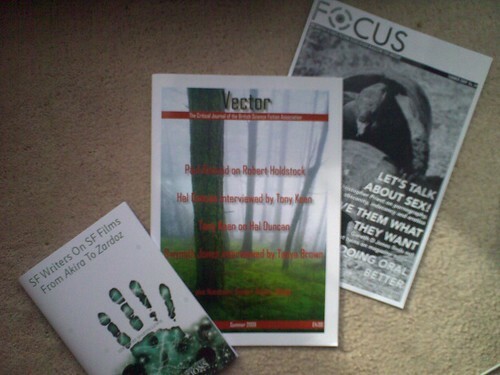 Also in the mailing, as the photo shows, is the latest issue of Focus, and the latest BSFA Special booklet: SF writers on SF film: from Akira to Zardoz, edited by Martin Lewis, who has posted about the booklet here. Adam Roberts has posted his contribution, on Blade Runner, here. Last, but certainly not least: Matrix Online has relaunched. with oodles of features and reviews. Are tasters of this ever going to go up on the Vector website? It’s been a long time since anything new has gone up there. At this point, I think the Vector website needs as thorough an overhaul as the Matrix one has had. And, practically speaking, with the survey responses to collate and write up, I’m not going to have any time to give it attention in the next couple of months. So, probably not, I’m afraid.